Czech Republic's Jiri Raul keeps the puck from South Korea's Choi Kwang Hyouk during a preliminary Ice Hockey match of the 2018 Winter Paralympics held in Guangneung, South Korea, Sunday, March 11, 2018. 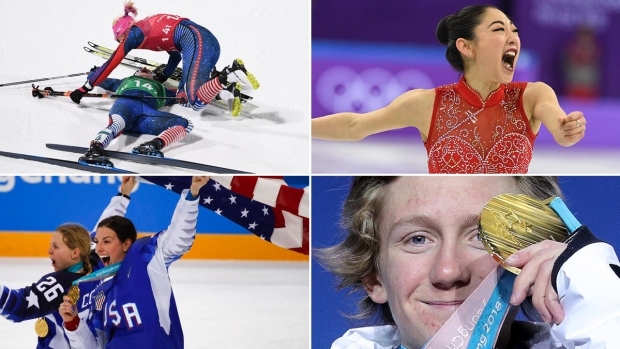 The most talked-about athlete in the Paralympics barely plays, but who cares? The diminutive but hard-nosed reserve forward on South Korea's sled hockey team proudly admits he's just happy to be here. After all, Choi Kwang Hyouk has come a long way. He escaped one of the most brutal and isolated places on Earth as a one-legged teenager and traveled weeks through China on crutches before finding freedom in South Korea. He battled through a sense of desolation for years while struggling to adjust to his new capitalist home before finding rejuvenation in a sport he says now means "everything in life." Now, 17 years after his escape from North Korea and four years since his first practice on ice, the 31-year-old is living a dream with the South Korean national team, which aims to clinch the country's first ever Paralympic medal in the sport in the games held at home. "The past is the past and I am all about the present," Choi said during multiple conversations with The Associated Press at the Gangneung Hockey Center. "What's important is that I am wearing the colors of South Korea, not the flag of any other country. I feel that I have arrived 100 percent." After sitting out South Korea's 4-1 win over Japan on Saturday, Choi briefly saw game action in South Korea's dramatic 3-2 overtime win over the Czech Republic on Sunday. Choi described himself before the game as a player who likes the taste of hitting and getting hit, and he played like that in the final two minutes of the second period. Right out of the gate, he pinned streaking Czech forward Michal Geier to the boards with a force that knocked him over. Moments later, he made another physical play on the other end of the ice to intercept the puck and lay it off to teammate Jung Seung Hwan, who bounced his shot off the crossbar. South Korea overcame two late goals by Geier and won after Jung scored 13 seconds into overtime, sending the home crowd of 5,000 into a frenzy. After the game, Jung said his two minutes felt more like 10. "I was using all the energy I had — I thought No. 74 (Geier) was the only Czech player who was really threatening us, so I really wanted to press him hard," said Jung. "It would have been great if I got that assist, but what can you do? That's hockey — everything is happening so fast, you're attacking and defending at the same time, and you just have to move on, hoping you will get another chance." Everything about Choi seems linked to hustle and grit. About 30,000 North Koreans have fled to South Korea since the end of the 1950-53 Korean War, producing thousands of stories of heartbreak and dramatic redemption. But the tale of Choi's escape is exceptional even by these standards. Years after Choi was born in 1987 in a town near North Korea's border with China, his family was hit by a devastating famine that would kill hundreds of thousands of North Koreans in the 1990s. His parents split amid their struggles to survive and Choi and his sister were sent to their grandmother, who died when Choi turned 9. His sister was soon sent to an orphanage. Left on his own, Choi began begging at the train station in the town of Chongjin. He eventually settled on a trade of buying cheap ice cream from markets, sneaking into railcars, and selling them at higher prices to passengers during stops. On a day in May 2000, Choi was pushed off a crowded car just when the train began to pull ahead. The wheels caught Choi's left ankle and crushed it. Choi said he was carried to a local clinic, where a doctor amputated the area below his left knee without anesthesia. Choi said he fainted because of the excruciating pain and lapsed in and out of consciousness for about a week. On crutches, Choi went back to begging. He lived in crude air-raid shelters dug into the ground. He used wood scraps to collect the grease off train wheels and made fire with them to withstand the cold which he says left his face blackened with soot. Choi remembers those days as the toughest time of his life. "I had no dreams about a future," he said. "I just wanted to live with my family again and eat well." Things changed in the summer of 2001 when Choi was visited by his long-lost uncle. By then, Choi's father had defected to South Korea and sent his brother, who also escaped, to smuggle out his children. Choi crossed into China with his uncle and traveled through Yanbian and Shenyang before reaching South Korea in August 2001. His uncle was able to bring out Choi's sister months later. Life in South Korea wasn't always easy for Choi, not just because of the social and cultural differences. In South Korea, defectors from North Korea often face stigma and discrimination based on presumptions of incapacity. So do disabled people. "If a classmate didn't know something, it was because he didn't know," Choi said. "If I didn't know something, it was because I was from North Korea." He said it was also difficult to go through three more surgeries in South Korea because the bones on his severed leg kept growing. Choi said he slowly began getting his "footing" at Seoul's Yeomyung School, a high school specializing in educating teenagers who defected from North Korea, where he said teachers were more eager to help him. He tried out sled hockey for the first time in 2014, then as a student at the Korea National University of Welfare, and learned to love the physicality of the sport. "I always have it in my head that I am a relatively small person — if I am pushed, I am overwhelmed by an urge to hit back," Choi said. "Try anything aggressive in soccer, and they will blow a whistle on you. But in hockey, you have much larger freedom within the rules to bang into bodies. I got hooked." 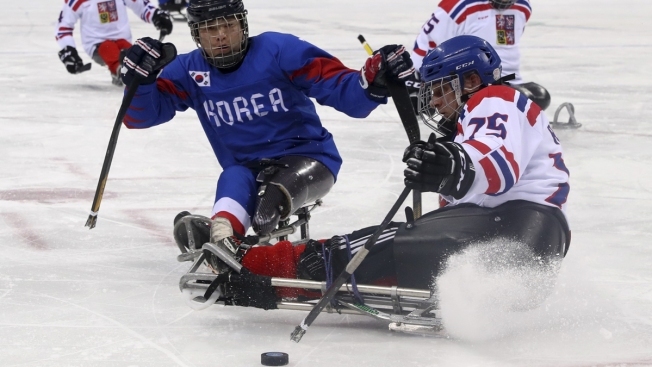 In 2016, Choi made the sled hockey team of Gangwon Province, which governs the Paralympic towns of Pyeongchang and Gangneung. He made the national team last summer. The Paralympics has so far been an exciting and unusual experience for Choi. He's playing in front of thousands of spectators in a country that never previously showed a passion for hockey, let alone disabled sports. It was also a surreal experience for him to see North Koreans at the athletes' village. North Korea has sent a 24-member delegation to the Paralympics, including two athletes, extending a political outreach it made to the South during the Feb. 9-25 Olympics. The sudden period of inter-Korean warmth, which follows an unusually provocative year from North Korea in nuclear weapons and missile tests, has now led to discussions about a potential meeting between U.S. President Donald Trump and North Korean leader Kim Jong Un aimed at defusing the international standoff over the North's nuclear program. Choi said he wasn't closely following the politics between Seoul, Washington and Pyongyang. He said it wasn't discomforting to see the North Koreans at the games, because "they look like us and speak the same language." However, he has no plans to talk to them because he still feels a "distance with them." After all, he feels right at home where he is. "I don't feel nervous because so many people are cheering for me here," Choi said. "It's like as if I am playing in my living room."